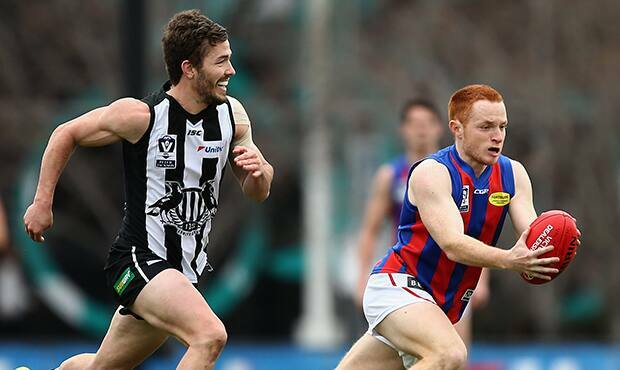 Collingwood's Matt Smith chases a Port Melbourne player at the Holden Centre. Image: AFL Photos. Collingwood’s VFL finals hopes now hang in the balance, after suffering a six-point defeat at the hands of Port Melbourne on Saturday morning. Down by 15 points at the final change, the Magpies stormed home in the fourth quarter; but inefficiency in front of goal once again proved costly for the Jared Rivers-led side. With minutes remaining, a goal to small forward Jordan Collopy put the Magpies only two points down. But a clutch goal from outside 50 to Port Melbourne’s Robin Nahas put the Borough back in front, and ultimately, the victory for the away side. Collingwood’s duo of ruckmen – Max Lynch and Lachlan Howe – both impressed in a scrappy affair at the Holden Centre, while Jack Hellier and Jackson Ramsay worked tirelessly all day. The loss leaves the Magpies in eighth position on 32 premiership points, with Werribee and the Northern Blues – who are both equal with the Magpies – still to play this weekend. If both Werribee and the Northern Blues lose to their respective opponents, the Pies will still play finals.